As a general practice, no personal Information is collected about a visitor to the website, apart from the personal information submitted by the visitor himself/herself in a ‘contact us’ form or ‘submit resume’ link. We shall use such Personal Information for the purpose you share it with us. However, at times, certain information may be collected from you when you visit the website. Such information is aggregated to measure the number of visits, average time spent on the website, pages viewed etc. This gives us an idea of which parts of our website users are visiting, in order that we may improve the content to offer you better services. We do not link IP addresses to anything personally identifiable. This means that a user’s session will be tracked, but the user will be anonymous. When you register to use a MagicBlockChainQA product, create an ID with us or use our services for development or support we collect information that is unique to you and identifies you. This may include your name, email address, phone number or payment information all in accordance with applicable law. Some information is required and other information is optional. Sometimes information regarding eligibility may be required. At times we may rely on information from public sources. We do contact organisation or executives as a part of our marketing campaigns. We do so, as we believe we have legitimate interest to promote our products and services andit also benefits our prospects. We do not do any mass mailing and carefully reach out to selected professional with a personalised approach. The emails we send you as part of our marketing campaigns allow us to know if you have received or opened the email, or clicked a link within the email. If you do not want us to collect this information from marketing emails, you can opt out of receiving such emails by clicking on the unsubscribe button. We may collect information when you interact with our social networking pages or use the sign-on features. We provide hosted services to many companies that may sometimes require the collection of information through cookies and other technology to collect analytic data required by the product and to understand our users and their likely interests. No information is collected without consent. To fulfil our contractual commitment and to enhance the performance of our contract with you. Analyze, diagnose and fix issues in our product and service offerings. To process your job application for an open position. In all cases this information is not shared with any third party. It is used by MagicBlockChainQA as above or to prevent/respond to protection of our websites or applications. In some cases like with hosted services, we may share information with those that provide us with technology services (e.g. web hosting and analytics services), but strictly for the purpose of carrying out our work. All such vendors used by us are EU GDPR compliant and have siged a Data protection agreement with Magic to secure your data. We may be required to share information with law enforcement or other third parties when compelled to do so by court order or other legal process, to comply with statutes or regulations. If we merge with or are acquired by another company, and if all of our assets are acquired by another company, this information will most likely be one of the assets to be transferred. However, we will not transfer any personal information of our customers until absolutely necessary to provide you with a continuity of service and only when the new owner maintains and provides the same level of data privacy standards as we do. In such cases, we will provide you with notice and an opportunity to opt-out of the transfer of identifiable data. How do we secure information collected? We understand that the security of your information is vital and have in place strong administrative, technical, and physical security controls and measures to keep data safe and secure. Our privacy practices are designed to provide protection for your personal information, all over the world. To protect information stored in our servers, through Amazon Web Service infrastructure at various locations like the US, Australia and India, access is limited (through user/password credentials and two factor authentication) to those employees who require it to perform their job functions. We use industry-standard Secure Socket Layer (SSL) encryption technology to safeguard the account registration process and sign-up information. Other security safeguards include but are not limited to multifactor authentication, data encryption, firewalls, and physical access controls to building and files. We would like to caution our visitors about phishing attacks, wherein unscrupulous third parties seek to extract sensitive and confidential information from you by posing as a genuine website or by sending an email misrepresenting it to be from a genuine source. Please be aware that we never seek sensitive or confidential information such as regarding your financial or health record through emails or through our websites. If you receive such a message claiming to be from MagicBlockChainQA, then please do not reply to it and immediately bring it to our attention by contacting the Webmaster. 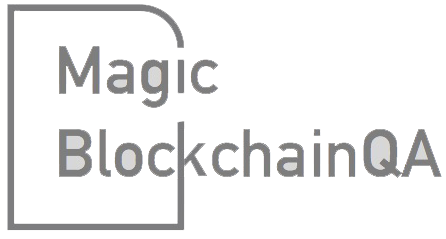 MagicBlockChainQA also recognizes the receipt, transmission or distribution of spam emails (unsolicited bulk emails) as a major concern and has taken reasonable measures, to minimize the transmission and effect of spam emails in its computing environment. Can this information be reviewed? In some cases and at our discretion this information may be accessed by respective organizations to correct any mistake in that information, and to delete any information we no longer have business reasons for retaining. You can do this by sending us an email. Be informed about the processing of your personal data (i.e. for what purposes, what types, to what recipients it is disclosed, storage periods, any third party sources from which it was obtained, confirmation of whether we undertake automated decision-making, including profiling, and the logic, significance and envisaged consequences). Object to your personal data being processed for a particular purpose or to request that we stop using your information. Request not to be subject to a decision based on automated processing and to have safeguards put in place if you are being profiled based on your personal data. Ask us to transfer a copy of your personal data to you or to another service provider or third party where technically feasible and otherwise required by applicable regulations. Withdraw, at any time, any consent that you have previously given to us for our use of your personal data. Ask us to stop or start sending you marketing messages at any time. Request correction of the personal data that we hold about you. This enables you to have any incomplete or inaccurate information we hold about you corrected. It is important that the personal data we hold about you is accurate and current. Please keep us informed if your personal data changes during your working relationship with us. Request the erasure of your personal data. This enables you to ask us to delete or remove personal data where you think that we do not have the right to process it. Any request for access to or a copy of your personal data must be in writing and we will endeavour to respond within a reasonable period and in any event within one month in compliance with Data Protection Legislation. We will provide this information free of charge unless the request is manifestly unfounded or excessive. We will comply with our legal obligations as regards any individual’s rights as a data subject. If you would like to contact us in relation to any of the rights set out above please contact us by email dpo@magicblockchainqa.com.To protect your privacy and security, we may take reasonable steps to verify your identity before providing you with the details.